Limited Quantities. Contact for availability and pricing. 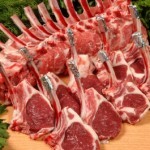 Icelandic lamb freezer packages, 1/2 lamb boxed (approx 20 lbs per half)-variety of cuts – $6/lb-hanging weight. Icelandic lamb is known for its mild flavour and lean, fine grained meat. All our lambs are raised humanely on pesticide free pasture. Antibiotic and hormone free. Limited quantities. Contact for availability and pricing.